The New Moon at 28+ degrees of Leo was the second New Moon in the sign this year. The New Moon was also a total solar eclipse, which was visible in the United States, from coast to coast. The eclipse was in conjunction with a trans-Neptunian object 346889 Rhiphonos. Rhiphonos is in the early degrees of Virgo, so this was an out of sign conjunction. In astrology, even if the eclipse is not visible where you live, it has an impact nevertheless, and the effect can sometimes be felt already beforehand. In Finland it manifested in the worst possible way on Friday, Aug. 18, 2017, when the first terror attack in our country took place. A Moroccan asylum seeker stabbed several people at a busy market place in the city of Turku. The attack was aimed at women. Two of the stabbed women died, eight people were injured. Two of the wounded are men who tried to help the victims. There would have been more casualties without the interference of some brave citizens, both native and immigrants. They risked their own lives when they heroically intervened in the assault. There was Rhiphonos working. In Greek mythology Rhiphonos was one of the twelve Dionysian Centaurs who drew the chariot of the infant Dionysus. Zeus had set them to guard his son Dionysus against Hera’s anger. Dionysus’s mother was a mortal woman, with whom Zeus had fallen in love and had an affair. The Dionysian Centaurs were originally sprites, but when jealous Hera found out about their assistance, she transformed them into ox-horned centaurs. The leaders of our country have stated that hate must not be answered with hate. Nonetheless, a pizza place in Turku and a barber shop in Helsinki were attacked during the weekend. A journalist, who wrote an article about one of the immigrants who helped the victims, received an avalanche of hate mail. Hate speech is gushing in the social media. The sense of safety has been disrupted among natives as well as the immigrants and asylum seekers. On Monday morning on my way to work, I noticed that there were no immigrants at all on the bus, or on the streets downtown. Obviously they are afraid of leaving their homes. In addition to the feelings of horror and sorrow, which the Friday’s attack aroused in me, it was a great cause of distress for me to realize and admit to myself that in Finland, those who have come here seeking asylum, need to fear us Finns. There is a lot of racism in Finland, and we should not shut our eyes to it. We need to do everything we can to prevent terrorism. President Niinistö said on Tuesday, that Finland has the right to deport those who seek asylum without a valid cause, and that opposing judiciary’s decisions shake the entire social order. The state leaders should also clearly condemn racism and note that racism is a crime, so that we all could get our sense of safety back. Every New Moon is a time of new beginnings. An eclipse is more powerful than an ordinary New Moon. An eclipse offers us a moment to pause, to notice the matter which calls our attention, and to choose a new path if necessary. The presence of Rhiphonos supports us in this. The Full Moon in Aquarius on Aug. 7, 2017, is a partial lunar eclipse. A lunar eclipse is more powerful than an ordinary Full Moon. The effects of an eclipse can be felt for about six months. The Sun in the opposite sign Leo, is in exact conjunction with 420356 Praamzius, a trans-Neptunian object in near 3:5 resonance with Neptune. 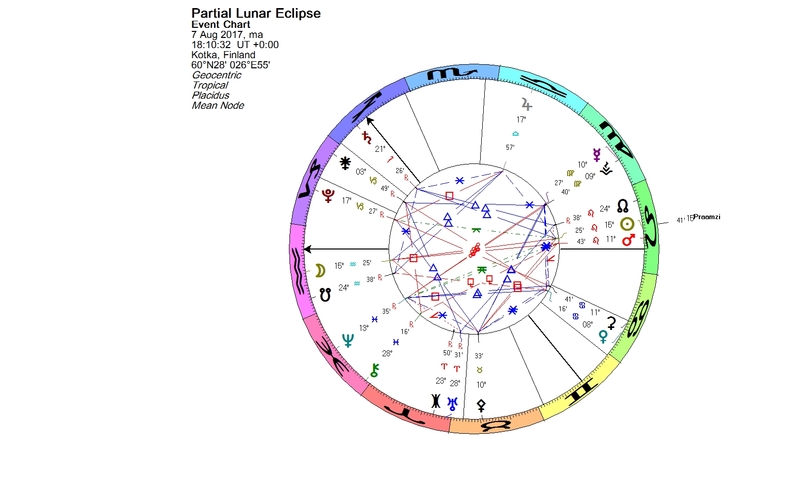 420356 Praamzius in conjunction with the Sun in this Aquarius lunar eclipse chart is emphasizing concerns over freedom, equality and friendship, which are attributes commonly associated with the sign of Aquarius. 420356 Praamzius was discovered in January 2012 by K. Černis and R. P. Boyle. Kazimieras Černis is a Lithuanian astronomer and astrophysicist, who has discovered a great amount of minor planets. Praamzius is possibly a dwarf planet. Its orbital period is over 280 years, and the orbit is very round. Praamzius has the second-lowest eccentricity of any TNO, after 2003 YN179. 420356 Praamzius was named in February 2016 after the oldest and highest Lithuanian god related to the creation of the world. Praamzius was the god of the sky, peace and friendship in Lithuanian mythology. March 15 – March 16, 1907 — The Finnish parliamentary election in 1907 was the first in the world with woman candidates, as well as the first elections in Europe where universal suffrage was applied. Nineteen women were elected. Eris was also in conjunction with the Sun and Praamzius in Pisces. March 22, 1916 — J. R. R. Tolkien marries Edith Bratt in Warwick, England. The story of Beren and Lúthien is regarded as one of the central tales in Tolkien’s mythology. The story and the characters reflect the love between Tolkien and his wife Edith. The Sun-Praamzius conjunction is in the early degrees of Aries. April 15, 1930 — Vigdís Finnbogadóttir, who served as the fourth President of Iceland from 1 August 1980 to 1996, was born in Reykjavik, Iceland. She was the world’s first democratically directly elected female president. Her Sun-Praamzius conjunction is in Aries. May 2 – May 5, 1945 — World War II: The Soviet Union announces the fall of Berlin; Lübeck is liberated by the British Army; the German Army in Trieste surrenders to the New Zealand Army; the Neuengamme concentration camp near Hamburg is evacuated; The Netherlands is liberated by British and Canadian troops; Denmark is liberated; Prague rises up against occupying Nazi forces; the prisoners of Mauthausen concentration camp are liberated; and the city of Amsterdam is liberated by Canadian soldiers. The Sun passed Praamzius in Taurus. On the Victory Day on May 8, 1945, the conjunction of the Sun and Praamzius is still in effect. May 9, 1950 — Robert Schuman, one of the founders of the European Union, presents his proposal for the creation of a pan-European organization, which he believes to be indispensable to the maintenance of permanently peaceful relations between the different nations of the continent. This proposal, known as the “Schuman Declaration“, is considered to be the beginning of the creation of what is now the European Union. The Sun-Praamzius conjunction in Taurus is exact. May 14, 1954 — The Hague Convention for the Protection of Cultural Property in the Event of Armed Conflict was adopted in The Hague, Netherlands. The Sun-Praamzius conjunction in Taurus is exact. May 16, 1955 – Captain Richard Phillips was born in Winchester, Massachusetts. He is an American merchant mariner who served as captain of the MV Maersk Alabama during its hijacking by Somali pirates in April 2009. He offered himself as a hostage to save his crew from the pirates. His Sun-Praamzius conjunction in Taurus is exact and sextiles his Jupiter-Uranus conjunction in Cancer. May 18, 1957 — Michael Cretu, a Romanian–German musician, singer, songwriter, and producer was born in Bucharest, Romania. He is the founder behind the German musical project Enigma. He has a triple conjunction of the Sun, Praamzius and Ceres in Taurus. May 28, 1963 — President Urho Kekkonen suggested in his speech at the Paasikivi Society, that the Nordic countries should establish themselves as a nuclear-weapons-free zone. The different attitudes of the Nordic governments prohibited, however, concrete negotiations on the issue at the time. The Sun-Praamzius conjunction is in Gemini. In Aries Jupiter was in conjunction with Eris. June 1, 1968 — Mathias Rust, a German aviator who during the Cold War years in 1987 flew from Helsinki to Moscow and illegally landed near Red Square and the Kremlin, was born in Wedel, West Germany. Mathias Rust has said that his flight was intended to reduce tension and suspicion between the two Cold War sides. He has a triple conjunction of the Sun, Nessus and Praamzius in Gemini. June 21, 1983 – Edward Snowden, who leaked NSA documents in 2013, was born in Elizabeth City, North Carolina. He has said, that by revealing his identity he hoped to protect his colleagues from being subjected to a hunt to determine who had been responsible for the leaks. 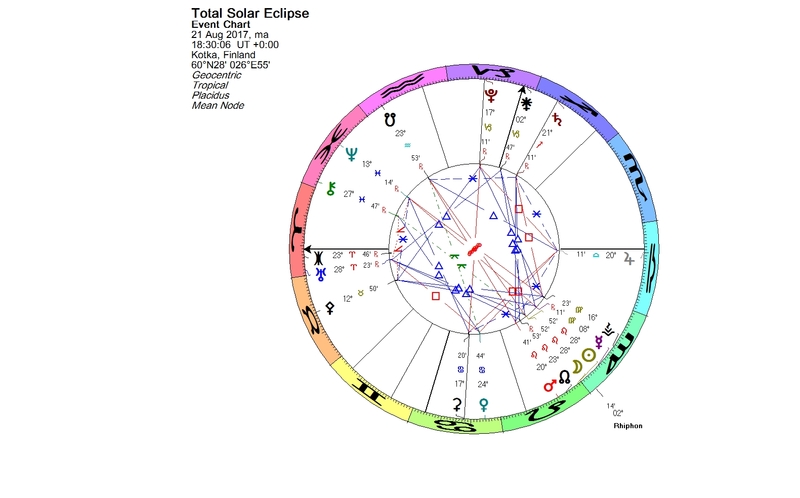 Snowden’s Sun in the last degree of Gemini is in conjunction with Praamzius in the beginning of Cancer. You are currently browsing the Lunations by Kirsti Melto weblog archives for August, 2017.